Active transit is human-powered transportation, such as biking and walking. Active transportation eliminates vehicle miles traveled altogether, so this alternative transportation mode is an effective way to conserve fuel, reduce vehicle emissions, and improve human health. Active transit requires adequate infrastructure that includes crosswalks, overpasses, sidewalks, and bike lanes or paths to help people travel safely. 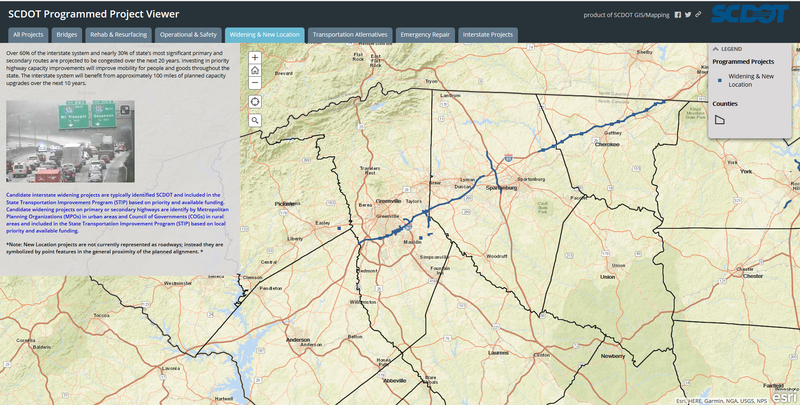 SCDOT's Interactive Programmed Projects Viewer showcases projects that are actively being developed. This can include projects in various stages of development, including the design, right-of-way acquisition, and construction phase. An increasing number of cities across South Carolina are creating Bicycle and/or Pedestrian Master Plans. These are plans for developing bicycle and/or pedestrian infrastructure in a city, with emphasis on promoting bicycling and/or walking as a viable transportation option and fostering a practical, safe, and enjoyable environment for cycling. Bike share programs provide bicycles for short-term use typically near busy locations conducive to one-way bicycle trips. Some travelers prefer shared bikes to bicycle only one segment of a trip or to avoid the costs of purchasing, maintaining, and storing a bike. Memberships and payment schedules usually encourage many short trips versus fewer long trips to minimize bicycle downtime.